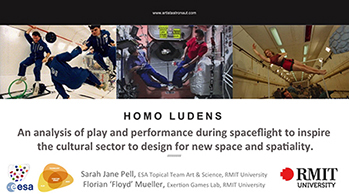 Homo Ludens: an analysis of play and performance during spaceflight to inspire the cultural sector to design for new modes of space and spatiality. 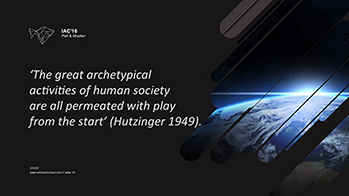 We recognise Astronauts as unique Homo Ludens and initiate the first taxonomy of the kinds of play and performance that has occurred in space. Expanding David Harvey’s matrix that relates space (absolute, relative, relational) to Henri Lefebvre’s tripartite spatial definition (experienced, conceptualised, lived spaces), we construct an initial understanding of interactions in space and spatiality terms and add the relational qualities of play and performance over spaceflight time (pre-flight, in-flight, post-flight). 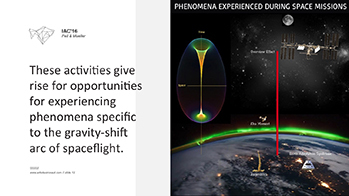 We use this to test our hypotheses that play and performance along gravity-shift nodes of the spaceflight trajectory help frame three commonly reported Astronautical phenomena. 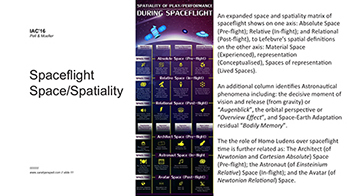 We deduce that spatiotemporal perceptions of the microgravity body are recognizably ruptured (Augenblick), then experienced in relation to the universe (Overview Effect) to reside with the individual as a lived experience (Bodily Memory). 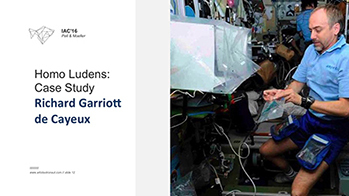 By analysing the play and performance of Astronauts pre-flight, in-flight and post-flight we hope to inspire designers to search for clues about how we inhabit, navigate and design in space. We can then recall these phenomena from bodily memory to inform the design of material play and representational performance experiences. 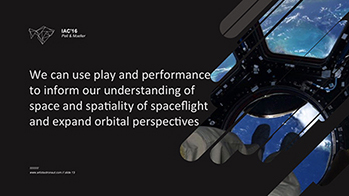 This paper contributes a new way to conceptualise the nature of play and performance as a technology to design opportunities for bodily play during spaceflight as an adaptive strategy in space habitation. Copyright 2016 by International Astronautical Federation. All rights reserved.